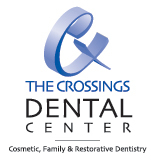 The Crossings Dental Center welcomes new patients of any age. Our team is ready to assist you in any way possible as well as helping to accommodate your scheduling needs. The Crossings Dental Center complies with all Privacy Practices under HIPAA regulations. We are often complimented about our "no-wait" policy. Your time is as valuable as is ours and by working as a team, we can continue to get you in at your scheduled time and out promptly. We close for lunch from 12:00pm until 1:00pm on Monday, Thursday & Friday and from 2:00pm until 3:00pm on Tuesday. Please note that we are available for emergencies and will do our best to see you the same day. Also, in that respect, we ask that if you are unable to keep an appointment, please provide us with that information at least 48 hours before your scheduled time. This courtesy, on your part, will make it possible to give your appointment time to another patient. The Crossings Dental Center is pleased to accept most dental insurance programs used by major employers in our area. Please realize that the amount your insurance will cover is determined between you and your insurance company. It is our pleasure to assist you in filing your insurance claims. Do note that you are responsible for the amount that your insurance does not cover. We accept Visa, MasterCard, and American Express. We also offer third party financing through Care Credit. To schedule an appointment, please reach us by calling (205) 987-8997 or sending a fax to (205) 987-2521.